Everything you need for cooking ,Include bag,chopping board,soup spoon,knife,Spatula,Scissors,Tongs,rice ladle. Portable:Perfect for family outings to the Beach, Park or picnic, hiking and camping. Folded, the pouch fits comfortably into travel luggage, trunk or it can be hand held. SMART, MULTI-PURPOSE DESIGN:Whether you're heading out for a camping or hiking trip, sporting event, boat ride, BBQ, the beach or park, cottage visit, this is a multipurpose camp kitchen accessory you can't live without. All of our tools are made from the premium quality stainless steel. 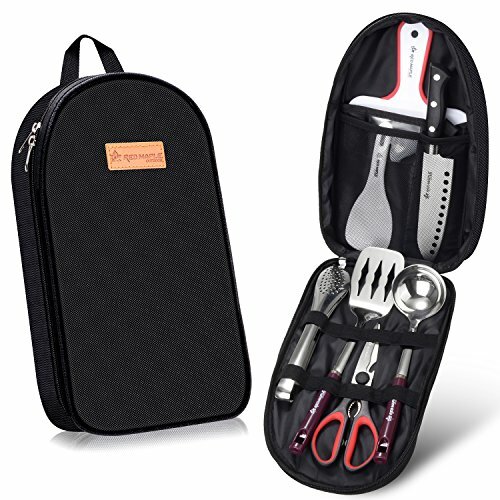 DURABLE AND STYLISH :Oxford Fabric bag keeps the utensils safe during travel and use while the high quality stainless steel utensils will keep their shape and hold up well. INDOOR AND OUTOOR--use for camping, hiking, travel, picnics etc. For beach parties, BBQ in a party,picnic,family day trip,road trip,carravanning,camping barbecue party,and so on. It is the perfect camp kitchen accessory, and it holds all your essential outdoor cooking utensils. If you have any questions about this product by TURN RAISE, contact us by completing and submitting the form below. If you are looking for a specif part number, please include it with your message.